If you don't die screaming....you're already dead! Just in time for Hallowe’en—if you hurry. 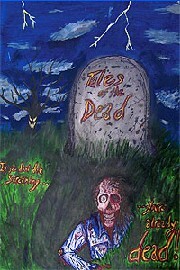 “Tales of the Dead” is an indie anthology of five horror stories. 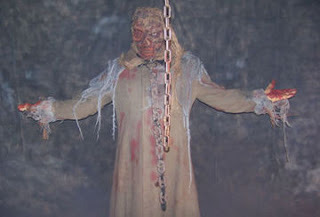 Each is free-standing as there is no connecting narrative, although some of the ghoulish characters do show up in the small vignettes between the stories. Except for the last tale, they are all supernatural with some aspects of everyday life to them and some foothold in reality. In other words, it could happen to you. Let me say first that I do recommend this film. It has a lot of heart, humor and imagination and from the opening credits on has an original look. You can tell that the filmmakers cared about what they were doing and for the most part do a good job. “Burlap” is the first story. It is about a very ordinary woman working late in a lonely office. We see her stalked by an unknown creature which is partly covered in the title fabric. His face is ghastly and gruesome in a very satisfying way. He stalks her on her way home and….let’s just say it doesn’t end well for her. The plainness of the woman, the security camera look of the film, and the commonplace situation add up to a very chilling story. Any of us could be working late some night and, who knows what could happen? The second tale is “Reckoning of the Werewolf” and for the first ten minutes or so I thought it might be my favorite. The three young women and their plight of being stuck on a deserted road at night is something any of us can relate to. Unfortunately the spell was completely ruined for me by the appearance of the werewolf. I reckon they had a very small budget and couldn’t afford fancy shmancy make-up or costumes. Please, please, please go back and watch “Cat People” (the original version). Take a page from the Val Lewton/Jacques Tourneur playbook. Less really is more. If you can’t afford a good werewolf costume, that’s ok – there’s no shame in that. Make up for it with more of what you were doing – fog, strange noises, a vague shadow moving in the dark. If you have to show something, make it just a quick shot of fangs. Trust your audience, we can figure out the rest. For the love of heaven don’t let the camera linger on a werewolf who looks like a fugitive from a Muppets on Ice! production of Red Riding Hood. When he takes off after his prey, he looks like Peter Cottontail hopping down the bunny trail. Please, don’t let your viewers down. Thank you! The same problem plagues the next story, “The Radio”. I was involved with the characters – the extremely creepy but amusing shop owner who sells the radio and the very annoying guy who doesn’t know how to follow directions. “Don’t play the radio after midnight”. So, he plays the radio after midnight. Demons arrive to drag the hapless schmuck down to hell which seems a little harsh just for leaving the radio on. However, it was ok until I got a look at the “demons”. They look just like little kids in Halloween costumes. With a little ingenuity you probably could go in a pretty monstrous direction with that. But, they just look like kids in masks. Once again, no dishonor in having a small budget. But if you have to use cheap make-up, KEEP THE LIGHTS DOWN. Again, let your audience exercise their imagination muscles for some of it. Trust us; we can imagine pretty horrifying stuff. if you happen to hit a demon with your car, don’t make it a hit and run. “Mistress of the Tower” is in some ways the best looking and well made of the bunch. It is a longer story—a little bit too long for me—and is presented as a silent film. There is a very evocative orchestral score and intertitles which convey the dialogue as well as the narrative. This is a fairy tale story of Darkael, the Lord of Darkness and the woman he creates to keep him company, Evel. Things go awry when Evel decides to go out and explore the world. It just goes to show—even undead, hellish Rulers of the Night have relationship problems. The actors do very creditable work. Some of the scenes, especially the outdoor scenes are shot beautifully. When the special effects, costumes and make-up are kept simple they work remarkably well. When they don’t work, as in the examples I gave above… hoo boy! The spooky spell which has been cast evaporates like Max Schreck’s Nosferatu in the morning light. It is very close to a rating of four kisses, but the flaws are too distracting for me. As I said, I do like this movie and it is worth looking for. 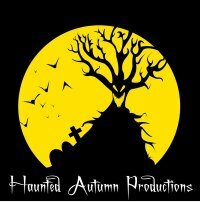 It was made by the folks at Haunted Autumn Productions out of Minnesota. NOTE: there is another film by the same name. Don’t get them mixed up.